As the day ended on January 12, 2010, Haitians were finishing their daily routines and returning from school, work and preparing for dinner with their families. Unbeknownst to 9.8 million citizens of Haiti, something was brewing underneath the surface and had been waiting to unleash its power for 200 years. At 16:53:10 local time, a massive 7.0 earthquake shook the land of Haiti, and within seconds turned the capitol city into massacre of death. It is projected that the disaster would claim an estimated 100,000-200,000 lives. Despite temblors in recent years, no one could have predicted the enormity of this disaster. The land of Haiti was once a land of lush pastures, mangrove forests and river valleys. A favorite subject of 15th century history, Haiti sits on the western side of the island of “Hispanola” which it shares with the Dominican Republic. The nation’s rich history is highlighted by its battles with Spain, British and France and its successful slave revolt which led it to its independence as the Republic of Haiti in 1804. Since its independence, economic and political instability have hindered its ability to become a prosperous nation. Moreover, it has created an impoverished economic landscape. It is deemed the poorest nation in the western hemisphere and among the lowest on many social indices. 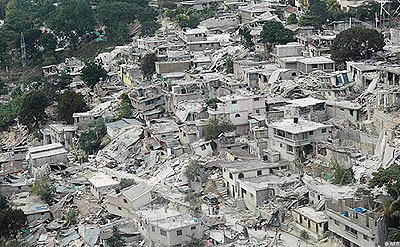 The 2010 earthquake dealt a devastating blow as thousands of buildings were destroyed. Photo from Getty Photos. Despite these misfortunes, Haitians are generally optimistic and have worked to improve the quality of life not only materially, but socially. In a vibrant social culture with the Creole language, Kompas music and eclectic cuisine, Haitians happily relish their social interactions. One of the social outlets having been reignited is chess. The nation first participated in the Dubai Olympiad in 1986 and according to olimpbase.org, has competed a total of six times (1986, 1988, 1990, 1994, 1996, 2006). The nation broke a 10-year hiatus when they traveled to Turin Olympiad in 2006. They were full of spirit, ambition and it was apparent that they were enthusiastic about returning to the international stage. Donning their distinctive Haitian caps, they were part of the photo of the opening ceremonies with the Italian team and seemed to bask in a bit of glory. Led by National Champion Piersont Lebrun and top scorer Jocelyn Bazile (8½/13), the Haitians ended on 21½ points (+3 =4 -6). While this was a modest showing, it provided them momentum for rebuilding their confidence and to make progress as an active federation. During the Olympiad, I introduced myself to Lebrun and told him, “My Creole is a bit rusty.” Lebrun broke into a smile. Of course, I spoke none of the indigenous language, but we did exchange a few words of French. He later introduced me to the rest of the team during an analysis session. The interaction was pleasant. Italian officials with pre-game ceremonies and photo-ops. I met her while playing in the North American Open in 2008. She traveled from Haiti to play in tournaments in the US at least two times because of her love of the game. Her organization, The Chess Academy, is based in Port-au-Prince and started in January 2008 for the promotion and teaching of the game of chess in Haiti. 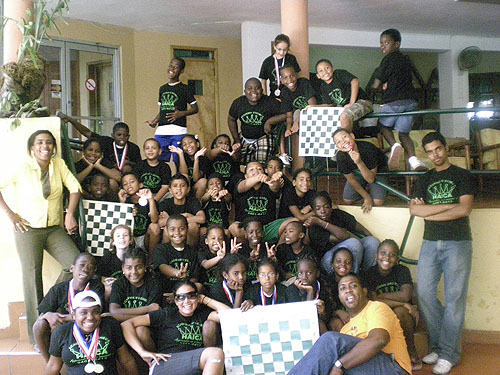 L'Académie d'Echecs HAICA is an organization founded on 14 January 2008 to promote chess in Haiti. 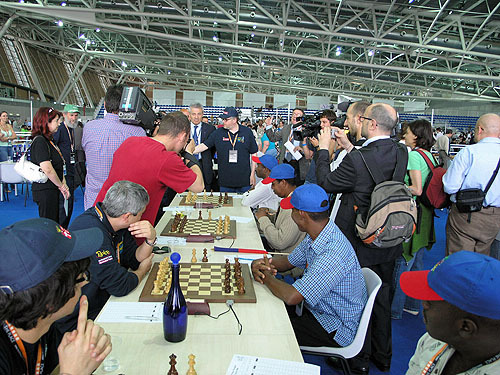 It is connected with the Ministry of Social Affairs and the Haitian Chess Federation. Sabine Bonnet, President, is on the far left. Photo courtesy of L'Académie d'Echecs HAICA. Looking at the pictures it is obvious that chess was beginning to take hold on the island. The Academy had secured a sponsor and was staging several tournaments both in Haiti and also participating in activities in the Dominican Republic. In 2008, the Haitian team had planned to send a delegation to the Olympiad in Dresden, but a series of hurricanes rendered that impossible. Eight-hundred people were killed and the island was ravaged. 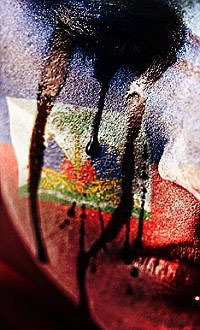 Despite the devastation, the Haiti chess community pressed on and continued developing programs. 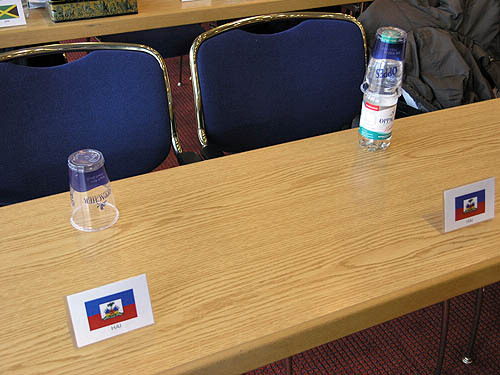 Haiti's empty seat at FIDE Assembly at the 2008 Olympiad in Dresden, Germany. They missed the tournament due to a series of hurricanes that swept through the area. They are facing yet another catastrophe. Send prayers and contributions. Photo by Daaim Shabazz. In December 2009, the country held its National Championship and crowned Mondoly Sanon as the National Champion after his undefeated performance of 7½/9 among ten finalists. 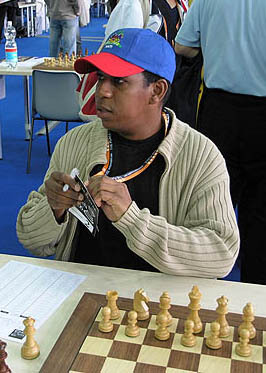 He was poised to be the top board for the Haitian side in the 2010 Olympiad in Siberia. Just weeks after the championship, the earthquake devastated the capitol of Port au Prince, a densely-populated city of one million. The media images of Haiti have been horrific. We have seen death and destruction in the streets and the most pitiful sight of mangled and bloated bodies left by the devastating earthquake. Assistance has poured in from around the world, but logistical challenges are hampering efforts. Thus far, no word has been heard from any of the Haitian chess players. The amount of damage done to Haiti will take generations to repair. Thus far, several sports organizations and Olympic committees have pledged moral support. FIFA President Joseph Blatter also released a statement of moral support. It is my hope that organizers, players and officials from around the world will show some solidarity in supporting relief efforts of a devastated nation. This is not a political conflict, religious, ethnic or class war, but a battle between the earth’s natural forces. Who knows where the next battle will be fought? The Haitian national anthem speaks of the Haitians being urged on by their ancestors to fight a valiant battle without the fear of death. It urges, “Our past cries out to us: Have a disciplined soul!” The ultimate battle that remains for Haitians may be survival, but we hope their strong resolve will result in a stronger nation. The chess community will be waiting for their return! Please donate to any of your favorites charities around the world. Organizations such as UNICEF have also set up a fund. Google “haiti earthquake fund" and choose from a variety of organizations to which you can contribute. This was a special feature written for ChessBase and featured 20 January 2010 by the same title.